Precision machine building at FALA means accurate integration. FALA provides complete equipment solutions by integrating precision machine components with software controls, electronics and optical positioning systems, often in Class 1 Mini-Environments. Accurate at FALA means the precise positioning of a part for alignment in a complex assembly while also minimizing end-user particle contamination. Often we use laser and optical tools to position and fix in space the relative alignments of the various subcomponent systems. Integration means fitting together our accurate subsystems with that of our business partners' into a unified solution for customers. It means wrapping the entire system in a software control shell that provides an easy-to-use, human/machine interface. FALA's niche market position is the manufacturing of precision prototypes and small volume builds. We work to simplify complex machinery by improving functionality and accuracy as well as reducing cost. Sometimes a customer will provide a stack of blueprints from which we build and other times we create the design and build ourselves. FALA enjoys working with that first precision prototype ... taking an emerging product from sketch to solid reality. "Engineering groups come to us with a set of prototype designs for a precision build with the understanding that we will make it more practical to build," said Frank Buffa, FALA's vice president of manufacturing. "We systematically examine the manufacturing process to determine how we can re-engineer the design, fabrication, assembly, test and improve ease of maintenance." 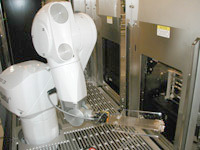 One example of FALA Technologies' precision machine building is the Reticle Transfer Metrology Tool (RTMT), shown above, which inspects reticles by removing them from hermetically-sealed SMIF pods. Using precise, robotic, clean handling grips, the RTMT places the reticles onto an optical precision stage to be examined for flatness and surface features down to the sub-micron or nanometer inspection level. The entire transfer handling inspection process is done in a Class 1 clean environment. Reticles are used in photolithography, a process that creates multiple layers of circuit patterns on a semiconductor chip. Also known as photo masks, reticles are glass plates, approximately 6 inches square and 1/4 inch thick, upon which photolithography circuit lines are etched for printing semiconductor chip circuitry. 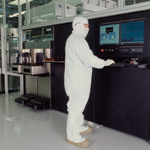 SMIF stands for Standard Mechanical InterFace, a standardized product enclosure (with interface) to move wafers between tools in fabrication plants using mini-environments. To produce the RTMT, FALA Technologies partnered with Zygo Corporation, a leading optical metrology company, to automate and integrate Zygo's inspection technology into a Class 1 clean handling, software controlled, semiconductor tool.